Nightly Entertainment in Banff by Taxi Mike! Live Bands 7 nights a week. Blues, Reggae, Funk, Pop. Dancing encouraged! Wild Bills 762-0333 • 201 Banff Ave.
Bruno’s (403) 762-8115 • 304 Caribou St.
Live Music with specials guests! Nourish (403) 760-3933 • 211 Bear St.
Special guest DJ's and bands! The Devil’s Gap (403) 762-8800 • 306 Caribou St.
Great Alternative Bands from time to time! Magpie & Stump (403) 762-4067 • 203 Caribou St.
Sean Andrew Dance & Marcel Show! Cheap drinks! Karaokee @ 10pm! SINGO – a new & exciting twist on the game bingo! Every Sunday at 9pm, free to play! Live music & pizza special. Live entertainment on Sundays @9:30! The Eddie Burger + Bar (403) 762-2230 • #6 - 137 Banff Ave. The Beaver (403) 762-4499 • 433 Banff Ave.
Just our drink specials and awesome atmosphere! Dancing Sasquatch (403) 762-4002 • 120 Banff Ave. The Infamous "Chuck Rose" plays for Maritimer Mondays! Toque Canadian Pub (403) 760-8543 • 124 Banff Ave.
High Rollers (403) 760­5300 • 110 Banff Ave.
$5 bowling per game. Cheap pint night! Live Bands 7 nights a week. Blues, Reggae, Funk, Pop. Dancing encouraged! Free pool in the back! Melissa’s - upstairs • (403) 762-5511 • 218 Lynx St.
Balkan • (403) 762-3454 • 120 Banff Ave.
Tuesday's are Greek Night in Banff featuring the live bellydancing of Hala Jama and platesmashing. Banff's only free live dinner show. The Balkan is a contemporary Greek Restaurant with old world flair. Set inside a warm decor with a crumbling rock wall interior, walnut and oak hardwoods and a massive communal table for those festive Greek parties the Balkan defies expectations. Famous for 12 hour slow roasted lamb shank, spicy feta dips, traditional Greek favorites and the largest selection of Greek wines in Western Canada the Balkan is an unexpected treat in the Rocky Mountains. 100% locally owned for 3 generations. Banff Ave. Brewing Co. (403) 762-1003 • 110 Banff Ave.
Tommy’s (403) 762-8888 • 120 Banff Ave.
Best Jam night in town! Why not Unleash your inner rockstar at our open mic night? Jam starts at 10 pm. Pump & Tap (403) 760-6610 • 215 Banff Ave.
Live music & Nachos special. Trivia Night! Here is your chance to win $50 Bruno’s Bucks and Bragging rights! Starts around 8pm! Be there early to sign up your team and get a seat! High Five Wednesday Hip Hop! Trivia from 9:30PM. Winner gets 50 Beaver Bucks! Beer Club w/Craig! starts at 8 pm! $10 (but you get beer!) How is beer made? WildLife Wednesday! DJs and cheap hiballs! St. James’s Gate 762-9355 • 207 Wolf St.
Live Band on Thursday, Friday & Saturday! Live Music (country music or Big Ticket shows)! It’s KARAOKE TIME! Starting at 10pm weekly. 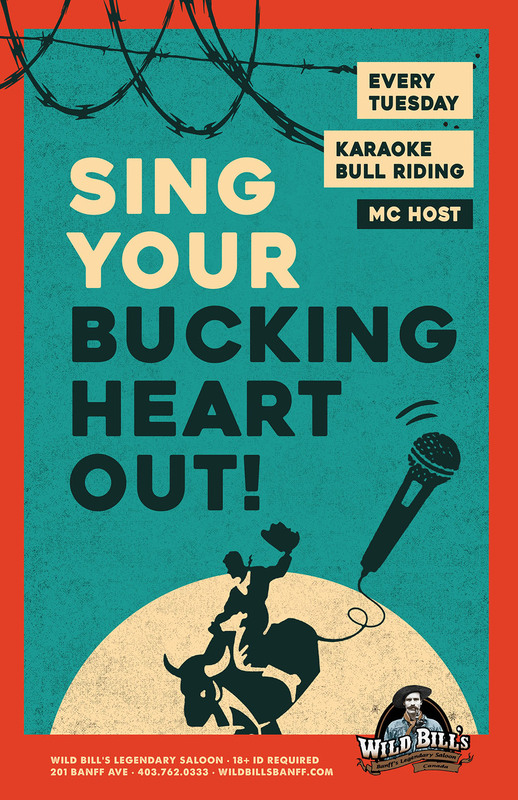 Come check out Banff’s wildest karaoke party! Waldhaus (403) 762-6860 • Bow Falls Rd. Thursday - Trivia Night Ready to test how smart you really are? If you are up for the challenge then we invite you to the best Trivia night this side of the Canadian Rocky Mountains. Start time 7:00pm. Friday is Open Mic Night. (or Jam Night) starting at 10pm! Some of Banff’s most talented local musicians jamming out all night long! Don’t miss your opportunity to show us what you’ve got! DJS! Drinks! Dancing! Stags & Stagettes! 48 beers on tap! Bar cameo by Park Master Distiller Matt Hendriks! THE party spot! Party like an Animal! Melissa’s (upstairs) (403) 762-5511 • 218 Lynx St.
Jerry's a Brit, Matt's a Canadian, so you know what'll be on... Footy & Hockey! They have Sports Packagse and 7 tvs all in HD! Elk & Oarsman (403) 762-4616 • 119 Banff Ave.
Big TVs. on every wall. Not a bad seat in the house! Brew Pub in the Clock Tower Mall! Big screens, Nice staff, Great beer! High Rollers (403) 760-­5300 • 110 Banff Ave.
Bumper's Beef (403) 762-2262 • 537 Banff Ave.
8 Big Screen TVs with sound!!! UFC headquarters! The best place to watch world-wide sports! Rugby, footy...! Saltlik Lounge (403) 762-2467 • 221 Bear St. The comfy lounge sports 6 TVs for all the action! Boston Pizza (403) 762-2192 • 2nd fl. 225 Banff Ave.
Nice lounge, great food and lots of TVs for all the games! UFC and all the Hockey! Where else can I watch the Big Game? Rose & Crown (403) 762-2121 • 202 Banff Ave.
Wild Bill's (403) 762-0333 • 201 Banff Ave.
Tommy's (403) 762-8888 • 120 Banff Ave.
St. James’s Gate (403) 762-9355 • 207 Wolf St.
Earls Lounge (403) 762-4414 • 229 Banff Ave. The Bear Street Tavern (403) 762-2021 • The Bison Courtyard, 211 Bear Street. Park Distillery (403) 762-5114 • 219 Banff Ave.
Tell your Server that TaxiMike sent ya!